3M Cold Applied Barrier Boots consist of a one piece EPDM rubber body suitable for operating wet indoors under conditions of ambient temperature and loading. 3M Cold Applied Barrier Boots consist of a one piece EPDM rubber body suitable for operating wet indoors under conditions of ambient temperature and loading. The 3M Barrier Boot is designed to accommodate bushings of cast resin or porcelain type with diameters between 40.0-70.0mm and is intended for Cold Shrink terminations of power cables up to 15kV with extruded insulation from 50mm2 up to 300mm2. The 3M Barrier Boot is a "push-on" type and provides the essential encapsulation of the metallic connection against ambient influences between bushing and cable termination and retains a constant compressive force on the sealing surfaces. This feature allows the 3M Barrier Boot to follow expansions and contraction cycling of the cable under conditions of loading even after prolonged years. The Barrier Boot insulator material is tracking resistance EPDM rubber, which minimizes leakage currents in wet indoor conditions. For more information about 3M Cold Applied Barrier Boots please see the 3M data sheet or contact us. The 3 Barrier Boot Kit 92-EE717-1 is available in one size and is packed one kit per carton. Each kit contains sufficient quantities of components to install the product series in three-pole cable end boxes. Suitable for use with all standard cable lug designs. UK Utility Approved through Scottish Power, Northern Power Grid (Central Electric), Western Power. (Please select appropriate part number for the correct barrier boot from kit type). 3M Cold Applied Barrier Bushing Boots are used on 11kV Indoor terminations of power cables, and up to a maximum rated 15kV, having extruded insulations of polyethylene (HDPE, LDPE), cross linked polyethylene (XLPE), ethylene propylene rubber (EPR) and aluminium or copper conductors. 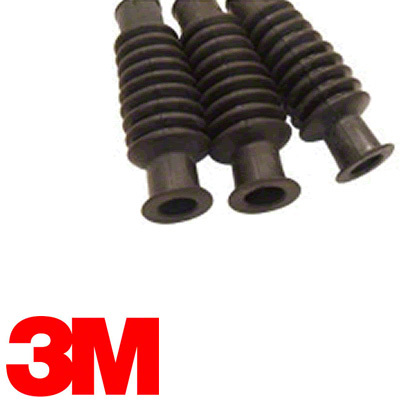 3M Cold Applied Barrier Bushing Boots are arranged in switchgear and transformer cable end boxes, in which the cores of cables are terminated approaching vertically from below and are connected to bushings fixed therein.